The following post is sponsored by adidas - and I honestly couldn't be more grateful because the shoes I'm about to share with you are legit THE. BOMB. Read on, my friends. I get a lot of people asking if yoga is my only form of exercise. The answer is: nope! Yoga is hands down me in my element, but as a Libra, I like to keep it balanced. Over the past year, I started mixing in cardio and circuit training (#TeamKayla) to keep my heart healthy and to build back up my endurance that I seemed to have lost when I stopped dancing. I love these shoes so much, and it has motivated me to stay out exercising for longer. Why? Because of the function, fit, and for the purpose of alliteration…fashion (style). Let me break it down for you, ladies. And yes, this shoe is a women’s specific fit. #BLESS. The UltraBOOST X is designed to respond to the way your foot naturally moves through each stride. Imagine it like a second skin, because it definitely feels like it (it’s really stretchy). The more energy you give, the more you’ll get. How? The cushioning is responsive and has a bounce to it. Basically, you feel super light on your feet and aren’t weighed down by hard and clunky landings. You’re pretty swift. The fit is what makes these shoes stand out from the pack. I have a pretty high arch, so I never feel like my shoes fully support it. 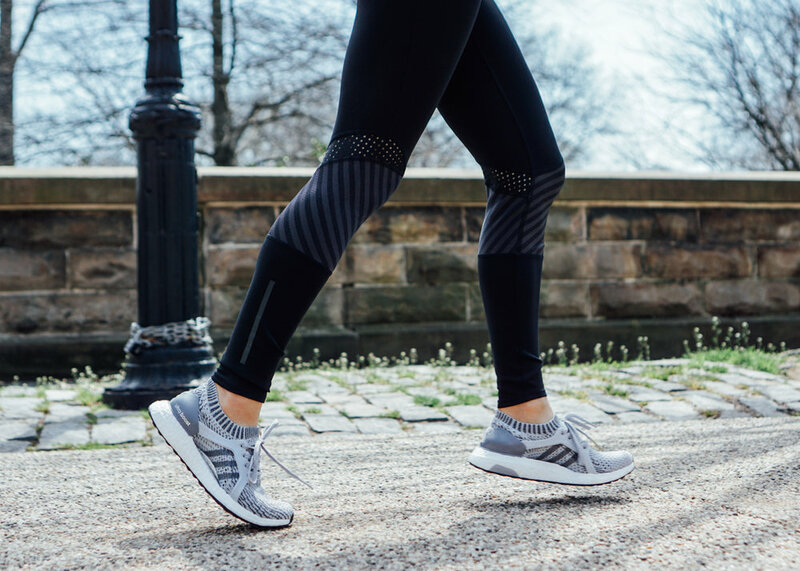 The UltraBOOST X is made with adidas Primeknit which essentially wraps your foot for an adaptive arch support. It feels like you’re putting on a sock. There is a floating arch - which looks really cool, hah - but, it’s really there so you get the closest fit to your arch instead of securing it to the sole of the shoe. They really thought of everything. It’s totally cool to want a shoe that not only performs, but looks awesome while wearing it. I also wear them when I’m not working out, but I swear I get through my errands faster because of it, ha. They are beautiful - I chose the grey color (shown in photos), but this particular style also comes in a black/grey and a black/orange which looks pretty badass. If you’ve made it this far, then you’re amazing, and you probably love the idea of the UltraBOOST X. So, if you want to purchase your own pair, follow this link to get 15% off your order when you sign up to the adidas newsletter. Let it be a little gift to yourself for making it through winter. Alright, my loves! I’m off to Bali in 3 days, so I will be putting together a roundup of my favorite past blog posts to keep you busy while I’m OOO. Stay tuned! © 2018 Om & The City™ LLC. All Rights Reserved.